Put flour, salt and butter in a food processor and pulse several times to break up the butter. Add shortening. Turn on machine and pour in ice water and pulse several more times. Dough should be lumpy but still hold together when pressed in your hand. Working fast to keep the dough cool, turn it out onto a floured board, knead dough long enough to see it well-combined and form into one smooth piece of dough. Refrigerate in a plastic bag for two hours. Note: This is more dough than you will need for a single 9-inch pie pan. However, if you use a spring form pan, as I did, and you want to push the dough up the sides of the pan, this will give you enough dough to do that. Peel pears. In a large, high-sided pan, mix white wine, water, sugar, orange and lemon juice, and zest. 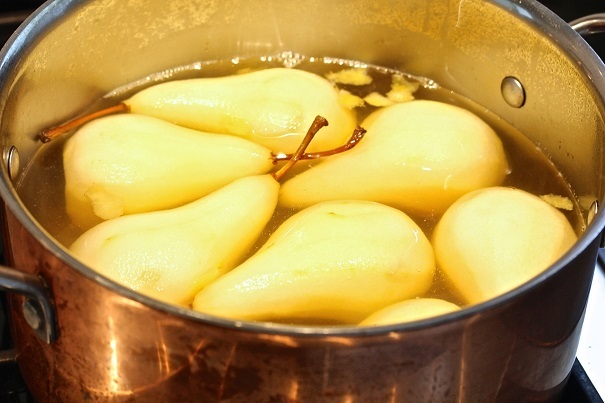 Submerge pears immediately in poaching liquid, to avoid discoloration. Simmer for 30 minutes. Turn off heat and remove pears. Drain pears and return poaching liquid to a boil. Reduce liquid by half. Whisk custard ingredients together and set aside. Remove dough from refrigerator and press into the bottom and several inches up the sides of a greased, spring form pan. Fold down extra dough to make the sides of the pastry extra sturdy. Cover the pastry shell in plastic wrap and refrigerate for 30 minutes. When dough is chilled, remove plastic wrap, line pastry with foil, and fill with dried beans or pie weights. Bake for 15 minutes and remove from oven. Allow pastry to cool. 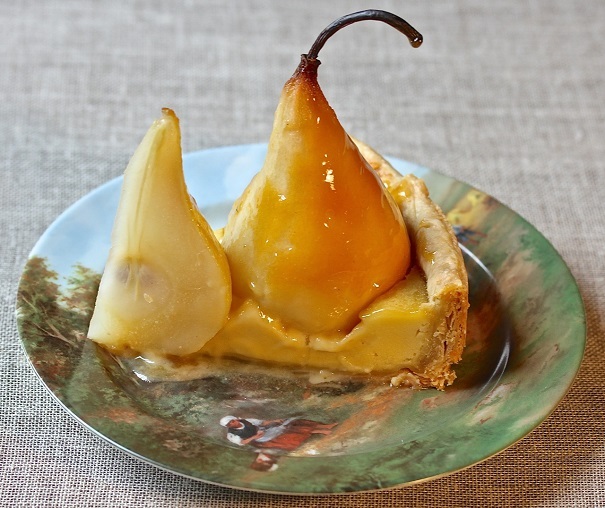 Stand the poached pears in the shell and pour the custard mixture around them. Bake at 350 degrees for 30 minutes, or until the custard is firm. Mix poaching liquid and apricot jam together and cook on low heat until it thickens, about ten minutes. Brush glaze gently on to pears after baking. Serve.